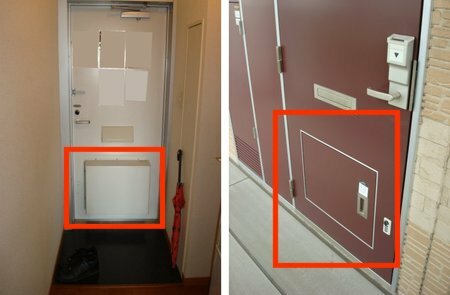 Some Japanese flats have parcel delivery boxes built into the front door so that parcels can be securely left for you without you having to be in the flat. This is a great idea that I hope becomes more popular. Like most people who’ve lived in London I’ve experienced bad service from postal delivery people, and a few times I’ve even written about them (here and here). Here’s how the Japanese delivery box works. 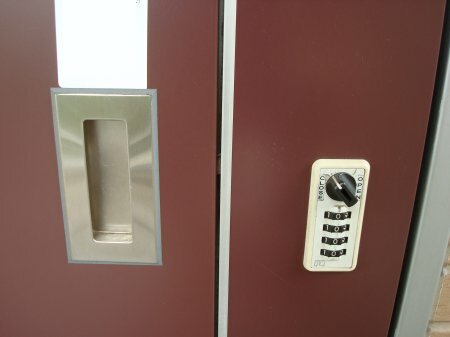 On the front door is a smaller door, locked with a combination lock. You can give the four digit combination to the delivery person. This could be a company, or even a friend who just needs to drop something off whilst you are gone. They can leave the item securely in the compartment. It is a very good sized, most things you might order such as CDs, DVD, electronic items, or food would easily fit in. You can easily fit a full sized desktop computer in here if you want an idea of the size. And the compartment even slides back to make it even bigger for very big items. No more missing deliveries while you are out, or having to travel ages to the parcel delivery depot! This entry was posted on Tuesday, June 29th, 2010 at 7:50 am and is filed under Japan. You can follow any responses to this entry through the RSS 2.0 feed. You can leave a response, or trackback from your own site. Where can we buy such a delivery box? I’m afraid I have no idea – they just come as standard on many front doors in Japan.